Editor’s noteSocial gaming site Zynga is making money hand over fist, but it also is facing new challenges in its relationship with Facebook. In this guest post, entrepreneur Steven Carpenter does a teardown of Zynga’s business model and calculates an estimate of its profits. Carpenter was the founder and CEO of Cake Financial, which was sold to E*Trade earlier this year. His last guest post was a teardown of group buying site Groupon. Like YouTube, Twitter, and Groupon, social gaming pioneer, Zynga is a member of the “fastest from founding to $1B valuation” club, having earned its membership in just 19 months. There are two significant traits that distinguish Zynga from its comparables, however. One, Zynga has generated the highest revenue and profitability numbers of any startup ever in such a scant amount of time (more so than even Facebook itself to date). Based on my estimates, Zynga is likely making a 30% net margin on $50 million in revenue a month, or close to $15 million in profit a month. Two, Zynga’s complicated relationship with Facebook means the company has less control of its own destiny. Zynga is under significant pressure to make a series of strategic moves to ensure its continued success. If it cannot do so, its attractive revenue and profitability metrics are certain to be impacted. In this teardown, I will detail how Zynga achieved its rapid success and dive into the key challenges facing the company. Zynga is the leading producer of online casual social games that can be played with friends and family across the leading social networks, on mobile phones, and now on the web. Indeed, playing games is one of the most popular activities on Facebook, up there with looking at profiles, sharing photos, and “liking.” As you can see from information I pulled from AppData, Zynga’s 246 million unique users per month means that over half of Facebook users are playing Zynga’s games. 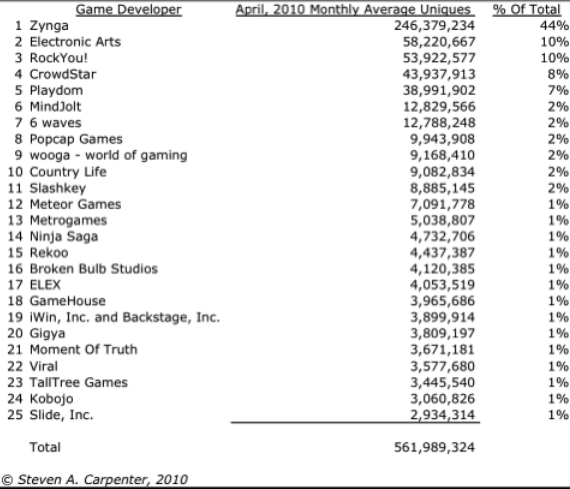 Zynga has almost 5 times more players than Electronic Arts, its closest competitor. While Zynga got its start with social versions of already-proven gaming titles such as Risk, Battleship, Boggle, Blackjack, and Texas HoldEm Poker, it quickly applied what it learned about these new gaming experiences to create its own franchises. In a short amount of time, Zynga has developed worldwide hits such as Farmville, Café World, Mafia Wars, Petville, and Fishville. Farmville alone now attracts over 100 million unique users per month, just 10 months after it launched. While the company has been accused of borrowing heavily from predecessor games, there is no denying the fact that Zynga is an expert at applying social gaming mechanics at a scale unlike any other company. There already has been a fair amount of work done to try and estimate Zynga’s revenues. Rather than focus on the top line, I took a stab at coming up with an estimate of the company’s profitability. Assuming an annualized revenue rate of $600 million, or $50 million a month, I arrive at a snapshot of what the financials might look like for April, 2010. (Note that $600 million estimate is on the high end, it could be half that amount). According to BusinessWeek, Zynga now has 775 employees, which at a $10,000 fully-loaded cost per month (including health care and taxes), would put its monthly obligations at $7.75 million. It also is estimated that the company spends between $5 million and $8 million a month on Facebook advertising. I believe this will be higher—$10 million per month—as a result of the rule changes to Facebook’s feed and increasing awareness for new platforms such as ZLive and the Zynga toolbar. I assume a significant infrastructure is required to serve 250 million players so that is likely running about $10 million per month. Transaction processing is difficult to estimate since PayPal usually charges a flat rate (say $0.30) in addition to a small percentage of the transaction, typically totaling 2% – 3%. PayPal said last week that Zynga is now its 2nd largest customer by volume, however, Zynga deals in micro-transactions so a typical fee structure does not make sense. In the BusinessWeek article the company stated that they are paying “under 10%” for each transaction, so let’s use 10% to be conservative. Based on these assumptions, I estimate that Zynga is earning at least $15 million per month, or 30% net margin. This is a significant number because of Facebook’s plan to force its application developers to use its proprietary currency, Facebook Credits, so it can take rent from all of the transactions happening on the site. A 30% transaction fee, which is what Facebook will demand, along with shrinking revenues and increased marketing to raise awareness of Zynga games on the web, could wipe out Zynga’s profit. How Fast Did Zynga Grow? According to the company, Zynga had 269 million active players in April, 2010. With that many people, it would be more accurate to talk about “Zynga Nation” considering that number of players would make the company the 4th largest country in the world—ahead of Indonesia and right behind the U.S. Last April the Company reported 30 million monthly players, thus Zynga has grown its monthly users by eightfold in just 12 months! Facebook, in contrast, grew almost 2.5X from 200 million to 484 million over the same time frame. I put together the following chart from user numbers released by the company over the past 18 months and you get a sense for the scale of its rapid adoption. How Did Zynga Grow So Quickly? There are six main drivers of Zynga’s growth. There is no denying the fact that Zynga benefitted greatly from the astronomical growth of Facebook itself. To test this, I looked at both companies’ announced monthly usage milestones since November, 2008. 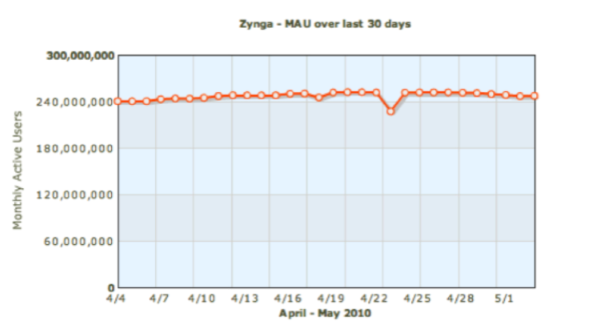 As you can see in the chart, the trend line suggests that as Facebook added new accounts, those new users in turn discovered Zynga games. So, on the one hand you could say that Zynga happened to be the right company at the right time and is the beneficiary of a once-in-a-decade tectonic shift in the Internet landscape. If only reason No. 1 was true then other early Facebook applications, such as Slide and iLike, would have taken off in the same way; and they did not. 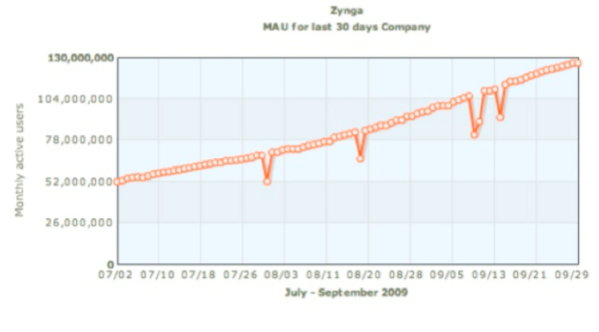 And, as I mentioned earlier, Zynga has grown faster than Facebook over the past year. Zynga created addicting games with core functionality that incorporated social elements and public interaction. Rather than trying to “win” games in the traditional sense, game play is an ongoing “experience” that does not end, where people play with one another, and others outside of the game play can follow along. As you can see, Zynga accounts for 31% of all active applications on Facebook, more than 2 times Facebook’s own apps. Clearly, Zynga has given people something to do on social networks. You even could make the argument that Facebook grew because of the value Zynga brought to the experience. Zynga was aggressive in promoting game updates in user news feeds. This allowed Zynga to get in front of millions of potential players without having to pay for customer acquisition. With Facebook removing this functionality, you can see how it could directly impact the company’s profitability by requiring it to increase marketing for the same level of promotion . In addition to expertly using the Facebook feed, Zynga was smart at using its in-game inventory to raise awareness of its other games. 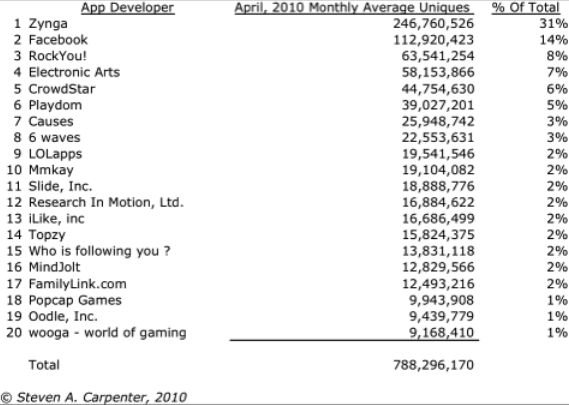 I looked at the company’s top 13 games, which account for 98% of all Zynga monthly players on Facebook. You can see in the “Months Live” column how Zynga leverages the traffic from its big franchises, such as Farmville, Texas Holdem, and Mafia Wars to introduce its new games. Notice that its newest title, Treasure Isle, which launched just last month is already the 4th largest game, having attracted its user numbers without the benefit of the Facebook feed. Preserving engagement of those long-standing hits is a critical component of its getting players to become aware of new games. Because of Nos. 1 and 4 above, Zynga generated higher revenues and returns on its games, giving it access to advertising dollars that its competitors could not match. In addition, Zynga was able to acquire fast growing properties, such as Yoville and Friends For Sale, with its valuable stock and then leverage its distribution system to acquire new users. The company also continues to sit on a warchest of its largely unspent $219 million in venture capital that it was able to raise because of its rapid success. Despite years of hype and numerous failed attempts at building a business based on virtual goods, Zynga was the first U.S. company to make it a reality. Who would have thought that millions of people would spend real money on a special octopus for their aquarium or a prized pig for their farm? Zynga deserves a lot of credit for effectively converting 1%-2% of its significant audience into paying customers. What Are Its Competitive Advantages? Zynga creates, launches, and manages games better than any other company. Games are a hit-driven business and have become more like Hollywood blockbusters in their heavy development costs and large marketing budgets. It is not inconceivable for EA to spend many years and $100 million to create and market a new game. Zynga does this at a fraction of the time and cost. For example, the company took just 5 months and 25 people to launch Café World, which now boasts close to 30 million players. 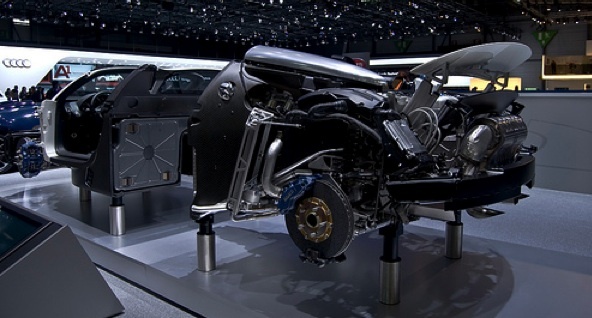 The company did this for likely under $10 million in development and $20 million – $30 million in marketing. So it has both a development and marketing cost advantage over EA and other traditional gaming companies. Zynga has also perfected “in-game evolution”—meaning the company is continually making enhancements to game play after it has shipped the product. By methodically monitoring how players are using the games, it can make continuous improvements to increase engagement, and therefore, revenue opportunities. Lastly, Zynga has raised more money than any other company in the space. The company was smart to build capital resources when it could because it allows them to outspend smaller competitors and to compete with larger companies such as Facebook and Apple. At this time, Zynga faces three significant challenges to its business. And it is playing itself out in realtime. Maintain Revenues/Profitability Amid “Mortal” User Growth: Zynga’s incredible hockey stick growth of the past 2 years appears to have come to an end. Comparing its growth from July – September, 2009 where it doubled its monthly players, last month was completely flat. Zynga needs to launch new hit franchises to continue high levels of engagement and convert a higher percentage of its players to pay for premium services and virtual goods. Become Less Reliant On Facebook: As TC reported last week, Zynga is moving quickly to launch ZLive, as well as individual destination sites for all of its games. This is critical to prevent the company from being held hostage to Facebook revenue share demands. A 30% revenue share could virtually eliminate Zynga’s bottom line. As you can see below, it has done a great job of getting a portion of its players to the first of these sites for Farmville. But, after a rapid ramp up, usage has been stable for the last quarter. It will similarly launch standalone websites for its other properties. Will its users embrace them? Prepare for Battle With Apple in Mobile: With over 60 million iPhones, iTouches, and iPads sold to date, Games are the No. 1 application in the Apple App Store. Collectively mobile games are a $3B+ a year business, according to Electronic Arts. Steve Jobs has stated that the company is going to be aggressive in social gaming across the iPhone and iPad with its next OS 4.0. Additionally, if Apple also controls advertising across apps, Zynga will lose another of its competitive advantages in cross promotion. It is unclear how Zynga will fare in this increasingly competitive mobile ecosystem. I suspect the company will combine the social mechanics that have worked so effectively online to a world where location is key, along with a continuous string of compelling premium Apps.